Duck hunting is probably one of the most popular versions of hunting in the US. The LaCrosse Swamp Tuff Pro promise to be the ultimate companion during this activity. With a price around $250 we can expect high-quality duck hunting waders and in this review I will test if the LaCrosse Swamp Tuff Pro hold up to that. LaCrosse specified exclusively on outdoor gear and is a well-known brand in the industry. They are around since 1879, still doing incredibly well, and by now they should definitely know what they are doing. 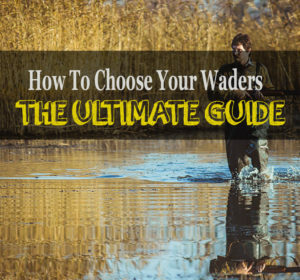 There is definitely a difference in terms of what a pair of waders has to withstand when you compare duck hunting to fly fishing. While it is true that fishermen tend to hike miles to get to the right fishing spot, they most of the time face way more water than dense bushes or murky swamps. 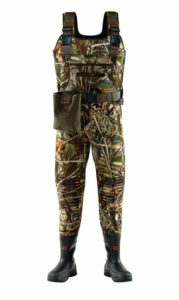 Because of that, duck hunting waders are usually made out of tough neoprene instead of breathable materials. Neoprene holds up to all kind of challenges and the thicker the neoprene is, the more you can rely on its durability. The inside of the waders is fleece lined, to improve comfort and warmth. On the outside a layer of Lycra and spandex was applied to reduce abrasion. The knees and the seat are covered in stripes made from polyurethane, to reinforce the areas that take up the most beating over a wader-lifetime. If you ever had a whole around the knee area, just because you kneeled on the wrong rock, you know that reinforced knees are a must-have feature. The boots are insulated with 1000G Thinsulate Ultra, and combined with a thick pair of socks, it will be hard to find temperatures where this is not sufficient. Inside the boots you will find a special system to hold your ankles in place, more on that later. The rubber outsole appears to be made out of different parts and it is definitely not comparable to all the cheap average bootfoot soles out there. Generally, in terms of quality, you definitely know that you hold something out of a higher price segment in your hands. No loose threads, no flaws, you really get the quality your would expect for $250. You can choose between normal, king, and stout in terms of width, so everyone should be able to find the right size for himself. I got normal and a size bigger than my regular size, since I read that some people complained about a too tight fitting. It worked out well for me and although it was still a bit tight during the first use, they tend to stretch out slightly and adapt to your body shape. The boots were big enough to fit an additional pair of socks in. One of the most important features for duck hunters will probably be the camo patterns on the Swamp Tuff Pro. You can choose between MAX-4 and MAX-5 Realtree. Although you will probably only use them as chest waders, they offer the possibility to fold them down and convert them to hip waders. Shoulder belts can then be used as a belt. Additionally the classic front pocket, the Swamp Tuff Pro come with fleece lined bilateral handwarmer pockets and an inside security pocket, which detachable and can be used for keys or your phone. 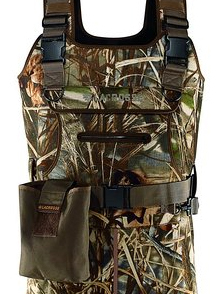 The waders also provide a rollout game bag and a removable rollout shell pouch. The straps have buckles and velcro since it is equipment designed for hunting, you will also find D-Rings for a shell holder on the front. Luckily it is getting colder here and the winter slowly rolls in, since I probably would not have been able to test the Swamp Tuff Pro. These waders are warm! You will never have an issue with freezing, trust me. I tested them in 30-degree cold water and I feel like that is not even close to their limit. The 5mm neoprene combined with the fleece inline insulates great. The only things I do not really like about 5mm neoprene is the buoyancy that comes with it. If you stand waist high in water, you will definitely feel how your legs want to push upwards slightly. Another area where they perform well is ankle support. Once you manage to get your feet inside the boots, it is hard to slip out of them again. If you ever wore bootfoot waders before while walking through sticky mud, you know how annoying it can be, if your boot gets stuck. Usually pulling them out just leads to your feet lifting out of your boots. LaCrosse made sure that this will not happen with their product. Keep in mind that you maybe want to order a size bigger since I could definitely see people struggle to get their feet into the boots in the first place. To test the tread and the fit of the boots, I walked about two miles in them, which was honestly a bit exhausting. These waders are heavy. The 5mm neoprene is also not really flexible and might limit your movement a bit. The boots are nice for walking though, they stick to your feet as well as they stick to the ground. Crossing the river a few times was no problem at all and they even perform better than a lot of the cheaper wading boots. I made sure to cross a few dense bushes every time I used them and now, after about 10 days of fishing, I have not encountered any problems with leaks. If duck hunting is your passion and $250 is in your budget, the LaCrosse Swamp Tuff Pro are probably the best choice out there. They are ideal for really early or late duck season and will keep you warm and dry. I would never recommend them for someone that plans on using them in summer, these are waders for cold and tough conditions! I am confident that this pair will hold quite a few seasons and easily outlasts most of its competitors. Another pair that is worth a look are the Frogg Toggs Amphib. With half the price and 3.5mm neoprene they are not designed for the same conditions but are a decent choice if you are looking something less expensive. I bit the bullet and got them. No regrets! Seriously, never was duck hunting that comfortable. I am confident they will last a few years and if you do the math, it is actually less expensive than buying one new pair of cheap waders every season. Good choice Jake. In the long run, it will be worth it!